Those Country Quilt Gobblers are warming up for the 5K Wingding at 7 a.m. Thanksgiving morning. It was such a delight last year that we want to continue our new tradition - even though Marilyn has broken a few turkey bones! However, not to be deterred, a wheelchair will do just fine. We need volunteers to do the Power Pushing for Marilyn in the wheelchair. The road is smooth and shouldn't be an obstacle. Call the shop and sign up for the Turkey Trot/Power Push today! And just so you know, Marilyn is already warning Susan about her personal speed limits and to that Susan said, "Get a seat belt." 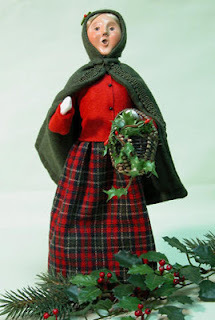 It's time we seriously begin to think about our most popular event of the year, the Christmas Mystery Class. Marilyn's checking our list, and checking it twice, because she wants to be sure who's coming and who is not able to attend. She has a short waiting list started and if you want to be added to it, let us know. We can't promise you a seat but we will fit in as many as possible. Sooooooo..... if you have already signed up, please call the shop to confirm your reservation. Also, please note that this year we are not having a night class. Both classes will run from 9 a.m. to 4 p.m. on Thursday , December 6th and Saturday, December 8th. Class fee $35 + kit fee of $50 for a total of $85 plus tax. 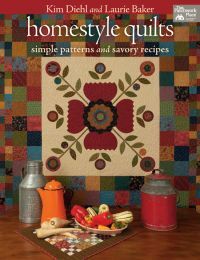 Kim Diehls new book, Homestyle Quilts is in! Co-Authored with Laurie Baker, this inviting book includes a baker's dozen of simply sewn patchwork and applique quilts, along with a gathering of Kim and Laurie's favorite quick-to-fix and slow cooker recipes. Come in and get your copy today! Below you will see the 14 entries for our shop challenge. We appreciate all those who participated this year. The entries were diverse and very interesting. It's amazing what people can do with the same four fabrics! We are very happy to announce our winners at the bottom of this post. Each entry is labeled underneath it's photo. We were very happy to see Marilyn in the store on Thursday. Her first job was counting the ballots and informing the winners of our Shop Challenge. It really was nice to have her back, even if it was only for a short while today!